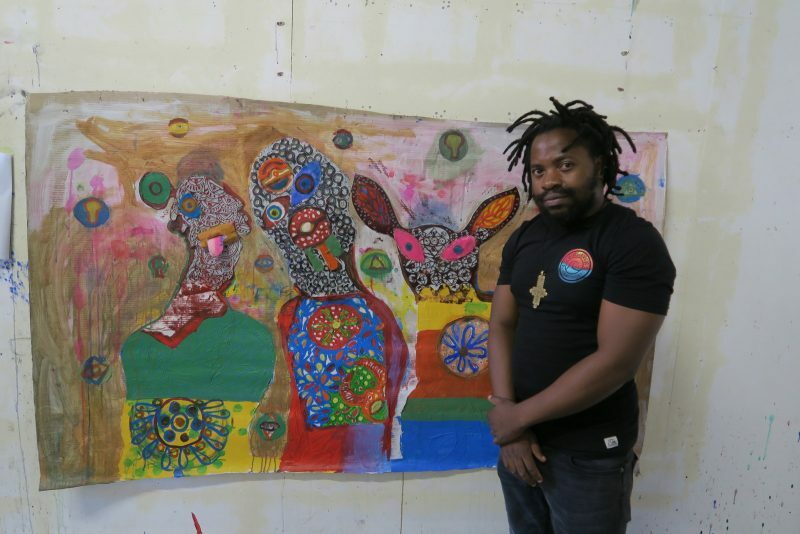 David Krut Projects is pleased to present our featured artist, Tendai Mupita. His work will be on show at David Krut Bookstore, 151 Jan Smuts Avenue from 1 – 8 April 2017. DKP first collaborated with young Zimbabwean artist, Tendai Mupita in 2014 when he was printmaking and artists’ assistant to Senzo Shabangu and Ethiopian artist in residence Endale Desalegn. A final year art student at Zimbabwe’s Chinhoyi University at the time, Mupita also spent some part of the year in classes and consultation with South African artists Kim Sacks and Toni-Ann Ballenden. Mupita has since been involved in several printmaking workshops and seminars in Zimbabwe alongside having shown in two solo efforts at Harare’s First Floor Gallery. He is the recipient of the 2017 Blessing Ngobeni Studio award, a 3 month residency at The Bag Factory. Working through a visual language that presents contemplations on meditative states; Mupita explores the processes and conditions of meditation through drawing, painting and mixed media. With a range of inspirations from religion, spirituality and traditional or cultural organisation of African societies, he uses the form of the circle as a starting point to deliberate on the various means and ends to meditation. The circle is a form intrinsic to many African monarch governed societies in addition to being a symbolic means of translation and understanding for the more occult margins of existence. The monarch generally takes a center seat and is followed by close advisors, elders, spouses, children in circular formations. support from the curiosity of energy patterns, disruptions and universal movement. Colour is an important element in his work as Mupita uses it as an agent to disrupt the complacency of cultured visual consumption. The symbolic material used throughout the works are used to the same end/effect. The works suggest loss or absence of locality in accordance with Mupita’s own meditational regiment. Meditation sees the mind/body/spirit losing consciousness of surroundings and external influences depending on the entity engaging the process. This is to say that in losing consciousness of one particular reality, one’s subconscious is awakened or made aware of an alternative reality and that reality is thus brought to conscious terms of understanding. The meditative state is one in which fractures are infinite and boundless. One state leads to another in patterns that can be seen as universal fractals. His use of humanoid figures carrying animal features reveal the human body as an animal of spiritual consciousness otherwise ruled by primitive gestures and instincts. Consequentially, the bodies and forms eluded to are secretive of their complete physiology in material terms and are continually found and re/discovered as distorted enigma.